The collapse of construction giant Carillion has thrown into question the UK government’s long-held attachment to outsourcing public services. Is cost-cutting to blame, or do ministers need to rethink Whitehall’s whole relationship with the private sector? Matt Foster investigates. The hastily-scrawled graffiti on the building site fence said it all: ‘Carillion. Bust’. At the start of this year, 43,000 employees awoke to the devastating news that the construction giant had gone into liquidation, putting at risk their livelihoods and raising major questions about how and why their employer had been allowed to fail so spectacularly. Workers on the company's construction sites reported being sent home that same day and, as PSM went to press, more than 1,400 former Carillion employees had been laid off. Already the blame game has started, and those arguing for an overhaul of Britain's corporate governance laws have a new case study to point to. 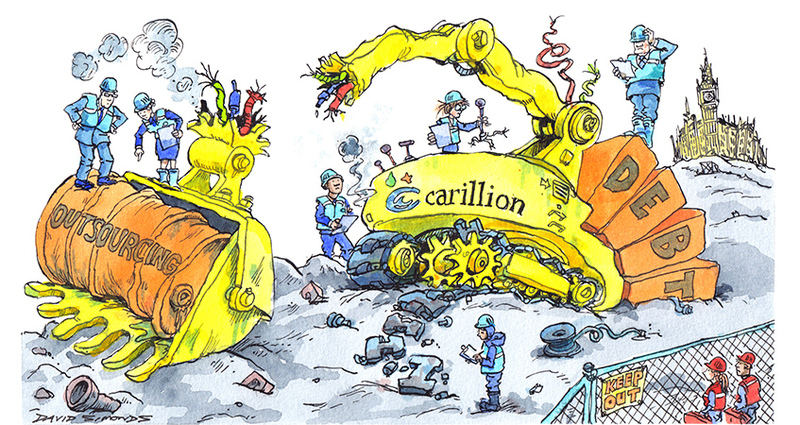 When it collapsed, Carillion had one of the largest pension deficits of any FTSE 350 company, and was mired in debt – owing around £2bn to its suppliers alone. But beyond the personally traumatic tales of lost jobs, unpaid bills and pensions at risk, Carillion’s collapse has strengthened the hand of long-standing critics of public sector outsourcing, and led to renewed questions about how the government manages its contractual relationship with private firms. The firm was one of the biggest suppliers to the UK public sector, responsible for 450 government contracts covering everything from maintaining accommodation for members of the armed services to constructing key parts of the High Speed 2 rail link. Carillion provided catering for schools, looked after hospital buildings for more than a dozen NHS trusts, and managed prisons for the Ministry of Justice. It was deemed so important that it was named as one of the government’s “Strategic Suppliers”, with a designated Cabinet Office official tasked with monitoring the firm’s performance. MPs demanded to know why key warning signs – increasingly late payments to suppliers, a major profit warning in July 2017 – were missed by government, which continued to award contracts to Carillion almost to the end. Ministers have fast-tracked the Official Receiver’s own probe into the causes of Carillion’s failure. And opposition leader Jeremy Corbyn has called for an end to what he called the public sector “outsourcing racket”. So what is the state of play in the UK outsourcing market – and where should officials turn their gaze as they try to learn from Carillion’s demise? Professor Colin Talbot of Cambridge University has long studied civil service procurement practices and has advised organisations bidding for public sector contracts. He tells PSM that, while officials may have feared the worst for Carillion, the sheer size of such firms means public intervention can be highly risky. Firms like Carillion are “publicly listed companies who are heavily reliant on borrowing to keep them going,” he says. “If you do anything that makes it clear they’re in trouble, you’re likely to trigger exactly the sort of problem you’re trying to avoid”. Nick Davies keeps a close eye on the government’s handling of commercial contracts as associate director of the Institute for Government think tank. He warns that the bidding process, which can run to “thousands of pages”, deters smaller firms for bidding for contracts. “Clearly that favours organisations that have expert teams that are used to bidding day in, day out and for whom that’s the only thing that they do,” he tells PSM. That’s a view echoed by Kerry Hallard, chief executive of the Global Sourcing Association, which represents specialist suppliers in areas such as IT and digital. She warns that the sheer time and energy involved in bidding for public sector contracts means the industry is “entering into a fairly monopolistic position with the really big players”. She points the finger at EU public procurement rules, which she says place heavy burdens on smaller suppliers. While her industry was overwhelmingly opposed to Brexit, she suggests the prospect of a procurement shake-up after the UK’s departure may be a “silver lining” for smaller players in the industry. But are civil servants not right to be cautious following the string of high-profile outsourcing failures in recent years – such as the bungled security arrangements at the 2012 Olympics and last year’s early termination of the East Coast mainline rail franchise, to name but two? Hallard accepts that some parts of the industry need to change their behaviour, but says the public sector needs to ditch “an ingrained mentality” which refuses “to accept the way that the private sector works”. Senior officials have robustly defended the Cabinet Office’s relationship with Carillion, claiming that the civil service has never been as well-placed as it is now to weather such a storm. Civil service chief executive John Manzoni has pointed out that many of Carillion’s contracts were run as joint ventures at government insistence, meaning that fellow suppliers could step in to ensure continuity of service. Ministers also moved quickly to put Carillion into the hands of the Official Receiver, with an instruction to keep vital services running – a “quite a deliberate act”, Manzoni says, which followed extensive contingency planning. Cabinet Secretary Sir Jeremy Heywood meanwhile denied claims that the civil service had failed to learn the lessons of previous contracting failures – in particular the 2013 scandal which saw firms overcharge the Ministry of Justice for the electronic tagging of offenders. He said the government had “absolutely prioritised” building its commercial capability in recent years, “bringing in more people from outside” and “having much more of a grip at the centre”. But other observers say there is still scope for Whitehall to sharpen its commercial acumen, and they raise questions about whether the civil service is attracting the people it needs to hold its own in negotiating with suppliers. Cambridge University’s Colin Talbot says commercial skills in government remain too generic, focusing on training people to design repetitive bidding processes rather than encouraging them to become real experts in the services they are buying. “One week they could be doing something on purchasing a new motorway, and the next purchasing catering facilities for the prison service or something,” he explains. Talbot also believes that the recent trend of centralising commercial expertise in the Government Commercial Organisation is a backward step, aimed at cutting costs rather than improving procurement. The Institute for Government’s Nick Davies acknowledges that central government has become “a much more intelligent client than it once was”, but he too believes that individual departments must give more seats at the top table to commercial experts. “Most people at the top of departments tend to be policy professionals rather than commercial professionals, and there’s a question of when in the policy and decision-making process those commercial experts are being consulted,” he says. 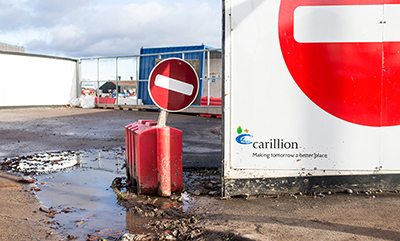 Unpicking the causes and policy implications of Carillion’s collapse will be no easy task, but it has given the opponents of outsourcing a powerful argument for radical change. The onus is now on ministers to explain how outsourcing can work better for the public – and how they will invest in the people they ask to fight for taxpayers’ interests whenever the government signs on the dotted line.